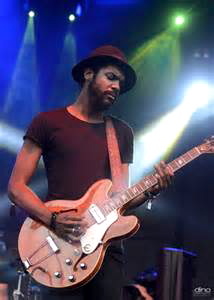 Guitarist Gary Clark Jr. brought his blues/rock review to Louisville Thursday night for an 8:00 PM show at the Iroquois Amphitheater, igniting a damp crowd on a rainy evening, and making all in attendance forget anything about the weather. I had been waiting in anticipation to see Clark for several years, since his “Bright Lights” EP dropped in 2011. This contained the tantalizing tracks of “Bright Lights” and “Don’t Owe You A Thang,” accompanied by two understated live acoustic numbers, which brought notice to the world that a burgeoning blues talent was prepared to make his presence known. Clark, from Austin, Texas, has steadily climbed the performance schedules at all the major music festivals since his initial release. Once his full-length debut, “Blak and Blu,” came out in 2012, Clark reached near headlining status. I missed him at Forecastle last year, but that turned out to be a blessing as Clark showed up this summer at the Iroquois Amphitheater. This would be a night of firsts, as I had never seen a show at this venue either. But when you consider Clark often plays concerts before more than 30,000 people, I was psyched to have him in this relatively intimate setting with 2,500 fans. Driving over to Louisville from Frankfort it was not just raining, but pouring. Hard enough that people had to pull off the interstate. This did not faze my enthusiasm. It was supposed to rain, and the system was going to move out of Louisville, leaving some drizzle. No worries, I was blazing tunes and pregaming in preparation to see a guitar wizard. First I met some friends at Baxter’s 942 Bar & Grill. I thought we might gain one more convert for the show, but it was not to be. I enjoyed my $2 Long Island Iced Tea and was on my way to see Mr. Clark. Arriving at the Iroquois Amphitheater, there is free parking to be found at the foot of the park. Many businesses are closed at this hour and their lots are open. My friend was already there and I joined him for some expedited pregaming in AutoZone’s parking lot. Entering the venue it seemed everyone had Miller High Life tall-boys in their hands. It just made me thirsty all over. Miller is a festive beer and we picked a couple up from the tent inside the entrance. Surveying the assembled crowd it was evident this was a sophisticated lot. Pulling a capacity crowd in Louisville on a weeknight is no given, but this is an old city and it knows its music. If you were hip to Gary Clark Jr. you knew to make this show. His Forecastle set was nice last year, but it was during the day, and Clark was sharing that event with like 75 other acts. Festival sets are fine, but it’s like taking a cruise, you only get an abbreviated sample of what’s on the itinerary. Thursday was a perfect setting. It was a stormy night for the blues, and the stage belonged to Clark and his band to explore as they seemed fit. In the meantime I wanted to check out the venue. The stage and about two-thirds of the seating were covered by a roof constructed of exposed wood-beams that blended into the wooded setting. We had reserved seats in the rear uncovered portion, but once you got back that way I noticed at the top of the aisle a covered section that ran across the length of the rear providing access to concessions and restrooms. This covered area turned into a congregating spot with the on-again off-again drizzle. It also overlooked the smoking section, which came in handy. The opener was Black Pistol Fire, and they set the table nicely. During the intermission we had a smoke and found a lovely bartender who was willing to mix us double Old Forester & Cokes to keep us from having to make another trip so soon. Bless her heart. Clark and his band entered a nearly dark stage, and it was kept dim much of the night as to not take away from their playing. He opened with a quiet intro version of “Blak and Blu” only to roar into the guitar slam of “Bright Lights Big City.” The rain mostly abated by this time but it mattered not with Clark’s electrified playing – all was good in the hood. Clark is a modern bluesman. He uses touches of hip-hop and soul, but they are used sparingly, to expand his sound and I imagine his audience, but at heart he is an electric bluesman. The treat seeing Clark live is his ability to improvise, which can’t be properly appreciated through a recording. He has the ability to riff off a song’s basic framework and expand its meaning through his expressive guitar work. This ends up creating something new and unpredictable, transporting the crowd somewhere unexpected. We were given the perfect set up for one of these journeys, as Clark ripped through the barn-burning arrest ode “Travis County” and then into the soul-tinged “Please Come Home,” which won Clark a Grammy. This brought us to “When My Train Pulls In,” which is designed for expansion. It’s a nasty blues-based track, with the grimace of Buddy Guy or Muddy Waters underneath it. I’m not sure who Clark’s rhythm guitarist was, but clad in a poncho and sombrero he had a gunfighter’s persona reminiscent of Clint Eastwood in “High Plains Drifter.” He never looked up from his work, and kept shredding with Clark. Together they took numerous expansive wanders into the stratosphere, playing off each other to ensure the journeys stayed afloat and compelling. This signaled a three-song run to finish Clark’s set that included the rock-a-billy blues rave-up “Don’t Owe You a Thang” (my favorite) and “Numb,” about the void reached when the fighting between lovers reaches epic proportions. Dressed all in black, wearing his trademark hat and flashing that big red Gibson guitar, Clark was an alluring figure. One thing I hope he develops in the near future is his showmanship. By limiting his movement as he elicits these rampages of notes, it appears as coming off too easily. He could really have the crowd in his hand by pushing his stage presence, but he does have that cool factor down cold. 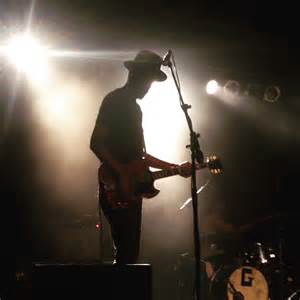 Thanks to Gary Clark Jr. and his crew – they provided a great night of entertainment and it was a blast hanging with folks to share in some live music. This entry was posted in Events, Liquor, Music and tagged Black Pistol Fire, Forecastle, Gary Clark Jr., Iroquois Amphitheater. Bookmark the permalink.